Phew. 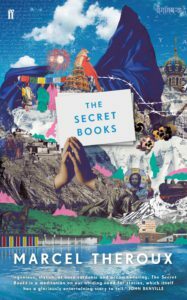 After a long gestation, this is my new novel THE SECRET BOOKS, which has just been published by Faber and Faber. Thank you to Max-o-Matic, a brilliant, Barcelona-based maestro of collage, for the lovely cover. Here’s a link to an interview about the book on “Meet the Author” with James Naughtie. It’s on the BBC iplayer for now, so may not work outside the UK. . .